The quartet of military misfits introduced in the original Battlefield: Bad Company are back and taking a backseat to a revamped (and far more exciting) multiplayer mode in Battlefield: Bad Company 2. On the single-player side of things, Marlowe, Sweetwater, Haggard and Sarge find themselves embroiled in a military endeavor that feels way above their level of understanding—appropriately, as the soldiers in B Company are tasked with hunting down a mysterious super-weapon that dates back to World War II. 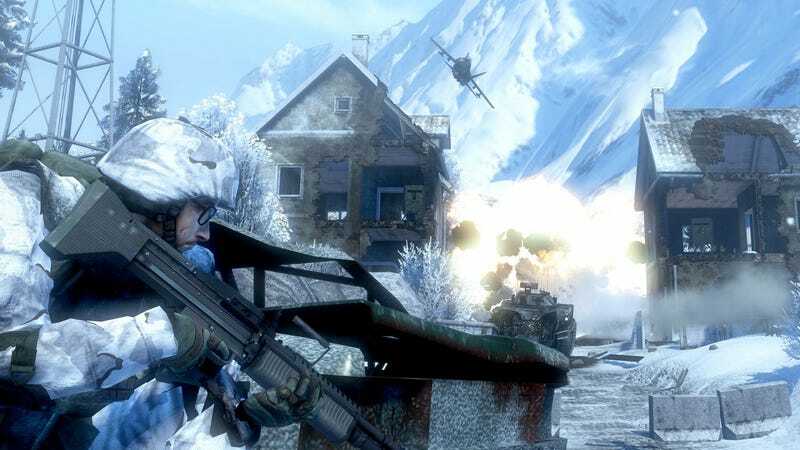 Bad Company 2 does some time jumping, with the game kicking off in Japan during 1940s, then leaping forward to the modern day, bouncing around from frosty locations like Alaska to balmy Bolivia and beyond. Along the way, bald bad guys must be stopped, lest freedom and the Dallas Cowboys cheerleaders are destroyed by a doomsday device in the hands of a madman. Battlefield: Bad Company 2's multiplayer has clearly been given more priority—just look at the game's box art, which favors a prominent "Battlefield" over the "Bad Company," the direct opposite of the first entry. Or simply play the game, which may be the best multiplayer offering fans of modern military shooters will get this year, one that outshines its single-player half. The Lighter Side of War: War has changed into something a bit more lighthearted. Sure, there are some serious dramatic moments that veer close to melodrama, but Bad Company 2 retains much of the laid back charm that complemented the action of the first so well. It's not particularly funny, mind you, despite the game's efforts to further establish the misfit, goofball nature of the stars of Bad Company, but the often comedic dialogue, occasionally grating, is a more amusing change of pace from the more serious military shooter. Players may feel some disconnect here, between the action of shooting scores of Russians and Bolivians in the face while the Bad Company squad ribs on each other—and mocks the Modern Warfare competition more than once—but it doesn't take itself too seriously. Hi-Fi Gun Fun: If you like guns and like shootin' guns, you're going to love Bad Company 2's arsenal. On the multiplayer side, that requires some unlocking of advance level weapons. In the campaign, players can expand their weapon selection by picking up collectible guns. That not only scratches the item collection itch, it prods players to experiment with the weapons left behind by your enemies. Bad Company 2's weapons are modeled beautifully, but it's the clear, crisp sound and tight feel of each shotgun, assault rifle and handgun that deserves kudos. So... kudos, DICE. Feeling A Little Lost: I like a little mystery and sci-fi in my drama, so Battlefield Bad Company 2's plot, the hunt for this enigmatic weapon that wails in a deep booming drone, kept me interested. That the mix of jungle, sci-fi and the mystery super-weapon's impact and aural design reminded me of something I'd see on Lost probably wasn't an accident. Big Country: Bad Company 2's multiplayer maps, like the maps seen in previous Battlefield games, are both massive and surprisingly detailed. In the game's Rush modes, in which players must defend or attack a pair of "M-COM" stations, you'll understand the impressive scope of Bad Company 2's battlefields. There is room for players, whether on foot or in tanks or helicopters, to breathe, making multiplayer sessions less of a spawn and die affair at the hands of those who have already memorized the maps. I never considered just how much an open area affects my ability to stay alive longer against better players, but BFBC2 makes me a fan of online multiplayer map sprawl. Deconstruction: The totally destructible environment bullet point from the first Battlefield Bad Company returns, only slightly improved, but still grand in its technical marvelousness. Buildings and fences still splinter, crumble and explode at the impact of frequent—very frequent—explosions to great effect, ensuring that players can't comfortably and reliably find cover behind just any wall. While you may hate DICE for its liberal sprinkling of rocket propelled grenade firing enemies, it's still some beautiful destruction to behold. Oh, It Has Multiplayer: Bad Company 2 got a big boost in the multiplayer department, expanding the number of multiplayer game types, but focusing on a few key variations on standard death match and base capture/defense. The now standard experience point system, leading to higher ranks and unlockable weapons, specializations and gadgets, is a little more slow moving in Bad Company 2. The multiplayer side of things just has a grand, extended feel to it, emphasizing teamwork, communication and smart tactics that should appeal to first-person shooter fans with a little more patience. Getting Over The Hump: The game's campaign takes some time to find its groove, venturing into more interesting territory in its second half. The motivations of your company and your enemy aren't always clear. Frankly, I'm not quite sure where I was and why I was there at times, focusing solely on shooting whoever was between me and that nasty super-weapon. My occasionally annoying squadmates and one overly zany helicopter pilot didn't help me enjoy being in Preston Marlowe's shoes. Bad Aim Company: Sweetwater, Haggard, Sarge, I appreciate that you guys are absorbing a few hundred rounds in the name of getting from point A to point B, but is it asking too much for the rest of B Company to pick up a few kills? I'm getting hammered by RPGs over here. Over and over and over and over again. Thanks. If you need to know what Battlefield: Bad Company 2 is all about, judge this book by its cover. It's more focused on online multiplayer than before—"Defining online warfare" its box art claims—and more Battlefield than last time. The game's single-player campaign, an explosive romp against an army of rocket wielding grunts that gets better as time goes on, but feels a little too familiar, is best thought of as a primer for the rest of Bad Company 2. The game's multiplayer suite is a big hunk of finely polished team and squad-based action. Playing as one of the four classes, each with their own unique appeal, or piloting one of the game's vehicles on these big Battlefield maps is a blast. That's where you'll likely spend much of your time, ranking your way up the multiplayer ladder, capturing flags and sprinting to the next M-COM unit. Gamers who may have felt a little burned by the original's focus on single-player in favor of big, broad Battlefield action likely won't be disappointed by what Bad Company 2 brings to the series. Battlefield: Bad Company 2 was developed by DICE and published by Electronic Arts for the Xbox 360, PlayStation 3 and PC on March 2. Retails for $49.99 USD to $59.99 USD. A copy of the game was given to us by the publisher for reviewing purposes. Played single-player campaign to completion and tested all multiplayer modes on Xbox 360.